Yesterday, we saw a bit of the idea of making mobile gadgets more sociable with each other. The idea is, through network/wireless and cabled connectivity, you extend possibilities for expression, control, and collaboration with yourself and others. It’s the same thing that makes a recording studio useful: tools work together to let people work together to create music. It’s absolutely not a new idea; the engineering question is just making it work well on new platforms. On iOS, we’re already seeing some of this: apart from MIDI connectivity, developer like KORG have even tried using wireless features intended largely for multiplayer gaming to connect multiple beatboxes and synths over a network. Continuing a look at the Android side of things, Andrea Belloni sends an open source project that gets a sequencer working over a network with a computer and Arduino-based hardware project. It’s really a proof of concept – let’s call it a hack of concept – so they say specifically they weren’t concerned with making it pretty. It’s at an earlier stage of the process, but it’s nice to see that. 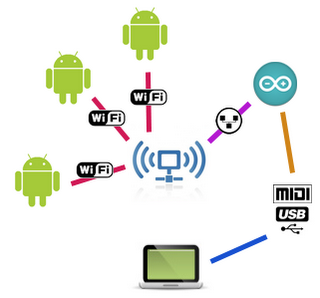 The basic idea is to control the hardware sequencer, built on Arduino, with a Processing sketch running on the phone, all over a WiFi network. Take the same basic idea and streamline the hardware a bit (the Arduino and shield get a bit clunky), and this could actually be practical. Yep, that’s the idea. Add in some other operating systems to that graph, too, if you like!